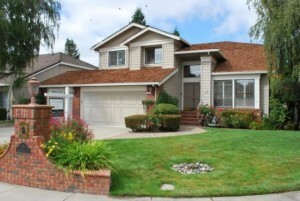 Gorgeous East Bay beauty just sold in Danville by the East Bay Short Sale Group where we represented the buyer. This 4-bedroom, 3-bathroom, 3-car garage immaculate short sale offers almost 3,00 sq. ft. of living space and sits on an 8,000 ft lot. This bright, open and airy home with high ceilings has been totally remodeled. The kitchen features a breakfast nook, granite countertops, a gorgeous center island, built-in refrigerator, custom cabinetry and solid hardwood flooring. Located in a serene cul-de-sac, this property has it all. The expansive, updated master bath includes tile flooring, his and hers sinks, a large dressing vanity and jet tub. This two-story California dream also offers a stunning back yard replete with a sparkling pool, raised hot tub, expert landscaping and an outdoor kitchen and dining area. Home Owner’s Association amenities include use of the neighborhood clubhouse, playground, pool, spa and tennis courts. This home sold for $867,000. The town of Danville is located 30 miles east of San Francisco in the heart of the San Ramon Valley and offers its residents a bounty of cultural and recreational opportunities. The city hosts a weekly farmers’ market, outdoor summer concerts, an annual Forth of July Parade, street festivals and many other family friendly events. The historic downtown and neighboring Danville Livery shopping center provide locals and out-of-towners with many shopping and dining opportunities. This home is located in the highly desired and highly ranked San Ramon Valley Unified School District. If you or someone you know is in need of a buyer specialist, call the seasoned professionals at the Fuller Group/East Bay Short Sale Group. We offer free consultations and can help you navigate through the daunting sales process, whether on a regular equity sale or a short sale transaction. We have experience working with every major lending organization, including credit unions and smaller banks. Don’t hesitate to contact us. We will work diligently until your home is sold. Next post: New Short Sale On The Water In Alameda!